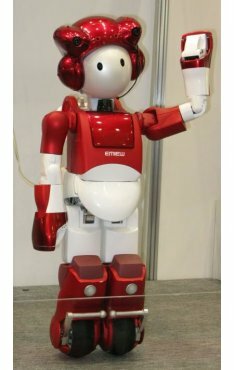 The latest robot Hitachi, EMIEW2 is intelligent enough to differentiate between three human voices simultaneously through 14 microphones embedded in his head that provide voice recognition capabilities. To this end, the voice recognition is a separate audio source and recognition profile noise. The first focuses on the direction of the person speaking, allowing the EMIEW2 to know who he speaks with a distance of 2 meters, ignoring all other noises. The EMIEW2 is 80cm high and it is suitable for the job of receptionist:). It moves through a wheel after each leg, and he can climb stairs.